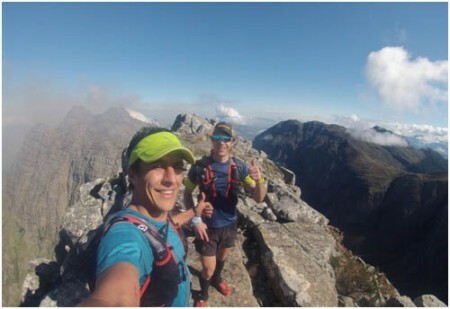 At the end of October, trail runner Christiaan Greyling and Edward van der Merwe bettered the Fastest Known Time (FKT) for the Jonkershoek Traverse (also known as Jonkershoek Marathon) route to set a new FKT record of 8 hours 21 minutes. 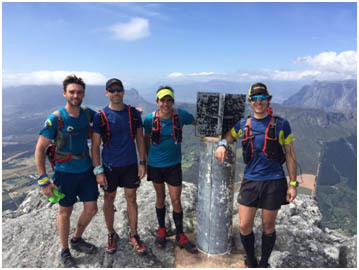 This new time beats the record set by Ryan Sandes, Andre Gie and Kane Reily on Saturday, 24 September 2016 by 14 minutes. 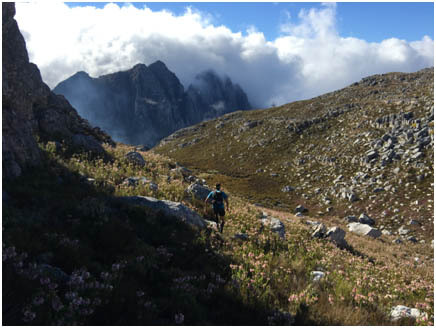 The route – known in some circles as the ‘Jonkershoek Marathon’ traces the top edge of the Jonkershoek valley in a horse-shoe shape. It runs from the beacon of Botmaskopto the beacon of Stellenboschberg. The route follows very few established paths, where most of the route consists of no paths, demanding a combination of navigational and mountaineering skills. Seven summit peaks are to be ‘ticked-off’ along the way: Botmaskop, Squaretower Peak, North Twin (Pieke), Rifberg (Virgin & Third Ridge Peak), Second Ridge (Katedraal), First Ridge (Katedraal), Haelkop and Stellenboschberg. The route is only 31km, but with a total ascent of 3500m+, extreme technicality, scrambling and exposure to extreme conditions makes this a demanding and challenging course. 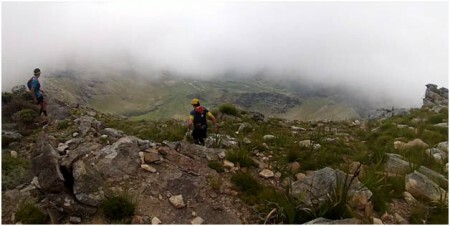 Greyling, a well-known South African Trail runner, was selected to partake in the World Champs in Portugal on Saturday, but due to an ASA boycott he was prohibited and therefore used this opportunity to express the freedom of trail running in his own backyard. “It’s always been on my bucket-list, and when Edward approached me to ask whether I would be keen, it was easy to commit. Edward’s motives to complete this route was to raise funds for school kids in Lesotho. I’ve known Edward only from our local training squad, bu tknew he has a brave heart and I felt comfortable with him as a partner. I had little time, and besides for one scout trip one morning before work, I’ve spent most of my time analysing Edward’s scouts on Google earth and built the perfect route. I had a good feeling about the attempt and believed that whatever the outcome, it will be an amazing time in God’s Creation,” says Christiaan. 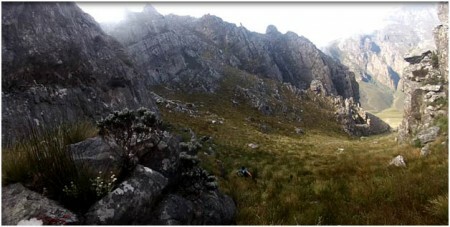 When Van der Merwe, a post-graduate Matie student, was asked what motivated him to attempt to break the Jonkershoek Traverse record, he responded by saying: “I am passionate about social development (especially children), and not just change for the sake of change, but rather sustainable change where individuals and communities experience lasting change. To do the challenge was at the back of my mind for years. It all came together when the opportunity arrived to use my talents, for a cause beyond myself. I used this to raise funds and awareness, to give the children of Semonkong, Lesotho, a chance to better education. 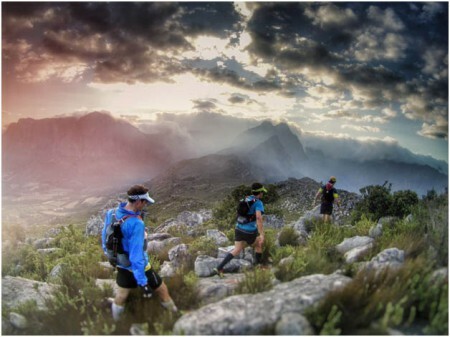 I admire Christiaan’s experience in trail running and enjoyed his positive energy”. Very friendly and familiar faces awaited Greyling and van der Merwe at the top of Swartboskloof, where after a very difficult section lay ahead with the second biggest climb of the day still to come. The view from the start at Botmaskop, not looking very promising with all of the smoke. 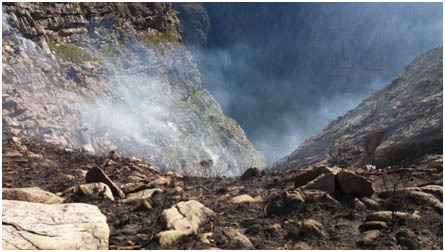 On our arrival on top of Botmaskop we were faced with an unexpected challenge: a wildfire. 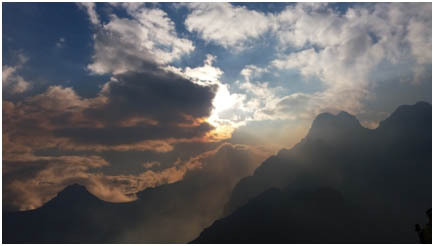 It very quickly seemed impossible to do the traverse, with the Banhoek valley on fire and the ridgeline covered in thick smoke. However, we decided to go ahead with the attempt and to assess the situation as we moved closer. We knew that it would be life threatening to get caught on one of the ledges in thick smoke or flames. Just after Pieke, we could see the fire on our left and we knew that we were in front of the flames and our only chance was to outrun the fire. 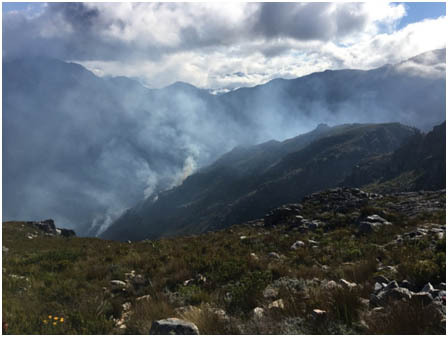 At Rifberg, the smoke was getting thicker, and when we popped over a ridge, we saw that one of the gullies was burnt to ashes, with a number of bushes still in flames. This gave us another safe option, should we have to turn back. We went from burned patch to burned patch, from escape route to escape route, more focused on the risks and challenges than breaking the record. We later realised that if we had started 30 minutes earlier, we would have been in a very difficult situation.